For the very first time in the U.S., time-resolved small-angle x-ray scattering (TRSAXS) has been employed for observing ultra-fast carbon clustering and graphite and nanodiamond production in the insensitive explosive Plastic Bonded Explosive (PBX) 9502, theoretically leading to advanced computer models of explosive performance. Carbon clusters are produced during the chemical process of detonation in high explosives, the carbon particle size, shape, composition and their evolution in time helps us understand how explosives deliver energy over a given time frame. The research was featured in the online version of the Journal of Physical Chemistry (C) in the month of August. Researchers from Los Alamos and Lawrence Livermore national laboratories used TRSAXS at the newly-commissioned Dynamic Compression Sector of the Advanced Photon Source at Argonne National Laboratory detonated small samples of TATB-based (triamino trinitrobenzene) PBX 9502 while high-brilliance x-rays are scattered by the solid carbon products formed in the detonation. Collaborators also included technicians and scientists from Argonne and Washington State University. PBX 9502 is considered to be an insensitive high explosive that is extensively used in the U.S. nuclear deterrent. High explosives are used for driving the nuclear “primary” to a critical mass, introducing a nuclear detonation. Insensitive high explosives are extremely complex to detonate accidentally, and are considered to be extremely safe. However, the exact chemical process of energy transfer is yet to be completely known. Researchers discovered that the development of carbon clusters takes place much faster than earlier thought, and the composition of the carbon is extremely different than had been expected. An unexpected and significant finding of this research was the ratio of graphite to diamond inferred by the x-ray contrast from the scattering measurements, in detonating TATB-based PBX 9502, we found that approximately 80 percent graphite and 20 percent diamond was formed when we were expecting to see a much higher percentage of diamond-like carbon. Dana Dattelbaum, of Explosive Science and Shock Physics Division. The products of detonation, type of carbon produced and the particle size dynamics can directly correlate to the type of explosive, thus enhancing computer models of explosive performance, resulting in improved predictive capability in guaranteeing the security, safety, and effectiveness of the U.S. nuclear deterrent. 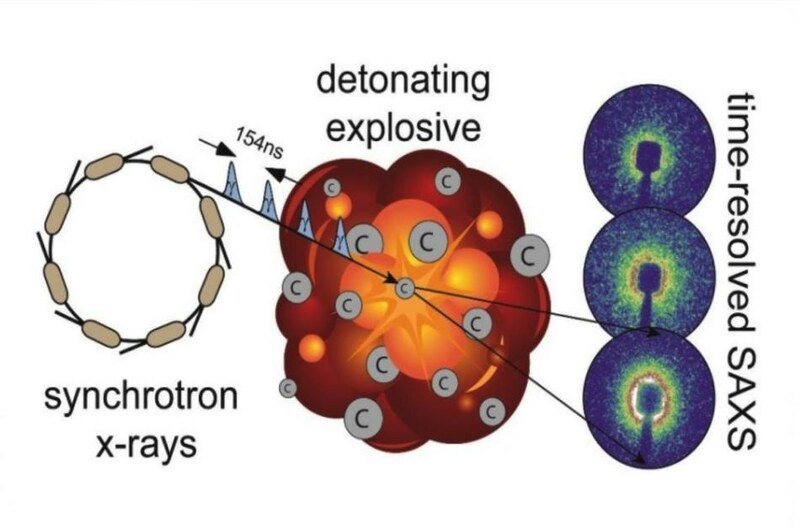 Analysis of the x-ray scattering data from TRSAXS showed speedy initial growth of carbon clusters within 200 ns behind the shock wave front in the three-gram explosive sample. Analysis of recovered products demonstrated that particle size did not go beyind a diameter of 8.4 nm and that particle size established that the particle growth did not continue after 200 ns for this charge size. What we’re really trying to do is understand how this process evolves over time, so we can better predict the velocity and energy delivered by a given explosive. The research has been funded by the National Nuclear Security Administration as part of Science Campaign 2 in support of the Stockpile Stewardship Program. The Center for Integrated Nanotechnologies and the Dynamic Compression Sector of the Advanced Photon Source at Argonne are user facilities.